I have left this morning for Havarock. I take my camera, hoping to grab some shots of the foliage while things have blooms. There has been an expected change in the last 7 days that we have been gone. I could see it coming before we left on our vacation in the wilds. The feel of the blooming mass of Spring has dissipated. It is because blooms don’t last forever and there has been no rain. Now, the transition to the succulents, Palo Verde, then Ironwood, saguaro and warmer temperatures will replace the many smaller annuals and biannual plants of earlier spring. This has begun. 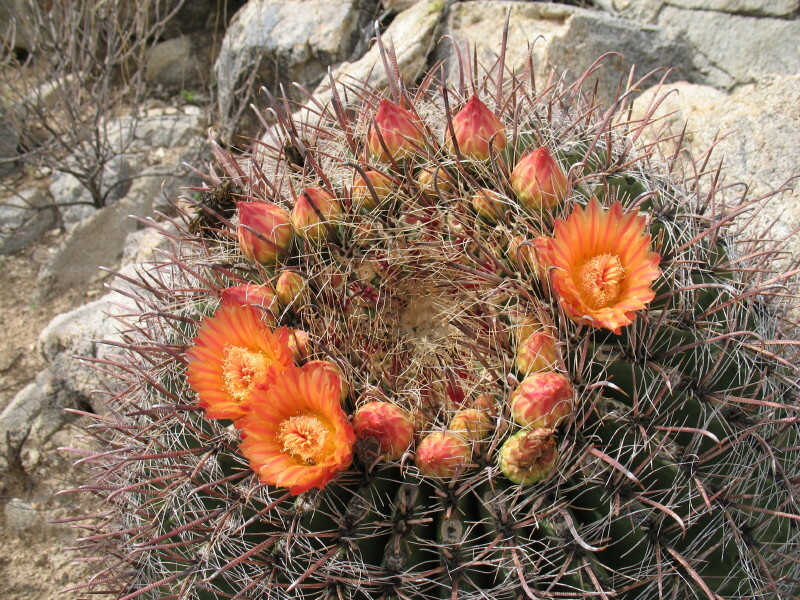 Buds and occasional flowers are attached to the cholla and prickly pear. 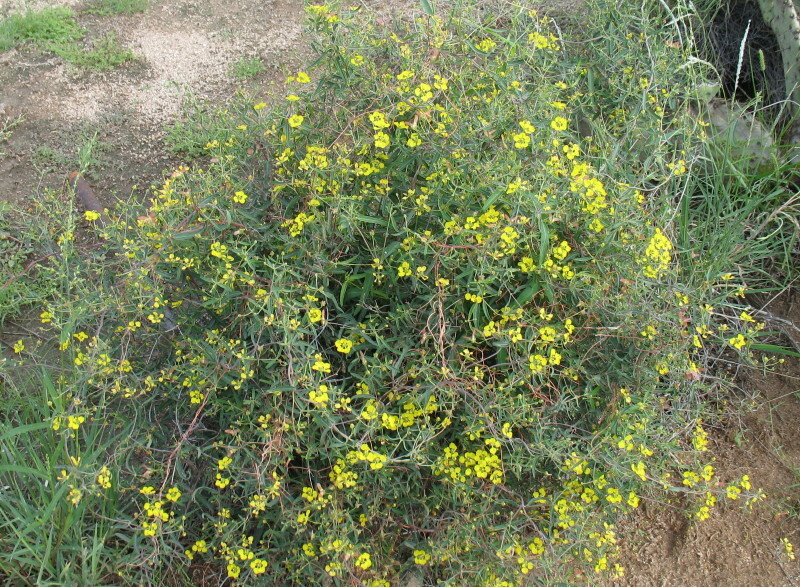 The mesquite trees have yellow blooms dangling among the new florescent green leaves. Soon DF’s house in town will have a layer of yellow pollen everywhere, to be replaced by an abundance of bean pods, and thoughts of their healthy brown flour. It is not desolate. There are very many small treats along the trail, but bold color is not as abundant. The light this day is a bit washed out. It began with a high altitude haze and pollutants have taken away the distinctions in the distant panorama. Still, there is much to love. The insects are busy. A swarm of bees occasionally passes by, putting naked me on alert. I climb upon Havarock and enjoy my time in the morning sun for over two hours. I have been studying a massage book that DF is sharing with me (we have decided that we need more massage). As usual, I work on my feet, but this time all of the leg gets close deep attention. This activity is good and healthy. I can feel it and enjoy its entrancing mindfulness as various sensations and releases are discovered. I stretch and do yoga poses. I sit, I lay down in the sun and I listen with eyes closed. The colorful patterns on the inside of my eyelids entertain, as the sound of busy bugs fill the silence. For a while, a tiny lizard travels along the branches of the small mesquite bush of a tree. It raised its body pushing up with its legs, gathering the sun’s energy, like me. I sip on precious water. The Javelina are not in the little cove today. There are no signs of their recent activity at Havarock. The treat is that all along the trail, there are multiple footprints, not only Javelina, but other wildlife! The easier corridor that I created is handy to everyone. I have heard the obnoxious dog next door barking in the night. It was probably the activity of the pack of pigs that excited him. The day has started simply and well.